Editor’s note: this is Part 2 in a series of two three. If you have not read yesterday’s Part 1, you’ll want to read it first. George did not react immediately, and still has not reacted. It’s now the next day. So we now know that they may have been biting him the whole time too. Not “preferring me.” Sure, they still could have preferred me, but he had zero reaction. We studied the places on his skin, circled in pen. Not a red dot, not a pinprick, not a single clue that a bug had spent five minutes sucking his blood. He felt no itch, either. The adults take longer to feed than the nymphs. I guess that’s intuitive but it’s still interesting to know. The nymphs were each like 2-3 minutes, and his adult was like 5 min and mine was like 10. Maybe I am actually tastier, or maybe the bugs were just different. My right arm, which had the cast skin on it, had no reaction. No itch, no redness. The skin sat there for 5 minutes, in two different places. I’ll continue to monitor it. But maybe, at least in me, there is no chitin hypersensitivity. I don’t doubt that it exists in others, but it hasn’t shown up in me. This leaves me confused, but at least I’m able to rule that out – or at least make a guess that chitin is not to blame. The spot where the adult bit me, showed a little white swell, immediately after the bug was done. This looked very similar to the little white swell that the nymph bite made. Neither of these itched, right away. During the time when the adult was biting me, G said that he could see my skin turning a little pink around the bug. This went away pretty quickly. 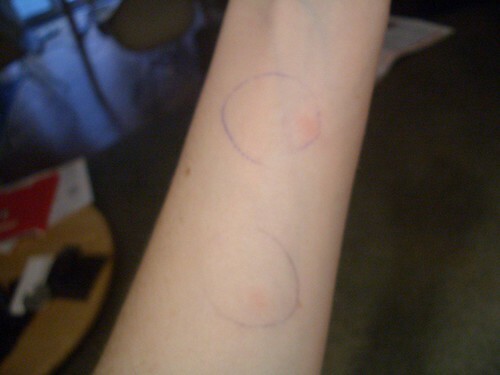 When we walked out of there, if it weren’t for the circles in pen, you would not have known we were just bit by bedbugs. I woke up a few times throughout the night last night, just because I was nervous. I kept thinking I could feel an itch on my neck. But no, there was nothing there this morning. Most importantly, my arms did not itch throughout the night. This morning, my left arm itched. And I will say with complete confidence that right now, the two bites look EXACTLY THE SAME. No joke. The nymph fed for like 3 minutes, and was teeny tiny. The adult fed for like 10 minutes, and got all big and fat and made my skin turn pink right then. Today, they look identical. Check it out in the photos. Finally, the itch started when I woke up and has been getting worse and worse all day. It itches hard. Both bites itch the same. They burn. They are sensitive to my clothes on them. They feel like my original bites did, but I don’t think I’ve felt an itch like this in a long time. And you know what, I WANT these to itch like mad – it helps me to confirm that I have NOT been getting bit by bedbugs these last couple months. Plus, I’m obviously not immune to the bugs’ effects. I didn’t think immunity was possible, but hey, now I have a little proof of that, at least in me. Now granted, these two bites are close to each other, and are maybe somehow affecting each other. They are also on the underside of my forearm, a pretty sensitive spot. I had bites here when our first infestation began, but none here this time around. I know that location has an impact. But let me just say, that I am feeling a little (okay, a lot) better about my recent “bites” being only some type of lingering sensation. I don’t know what it is, or what is causing it, and so far I don’t have reason to believe it’s chitin. But maybe bedbugs have forever changed my skin, and I’ll just get little itchy swellings from this point on. I will continue to monitor these bites. They are already bigger and itchier than they were just a few hours ago. Damn, an itch never felt so good. (I am not scratching – I’m trying not to even touch them). Plus, I faced my fear. Well, I didn’t totally face it because I didn’t look, at least not at the adult. But now I’m looking at the pictures G took. And here I am. With two growing welts, but otherwise, healthy and alive. This doesn’t make bedbugs less hated, but it’s giving me a little bit of perspective. I want to add that I don’t think everyone should do this, because if you had bedbugs and you’re still seeing “bites,” you should do every possible thing you can to get rid of them, and try every doctor or PCO before resorting to this test. In many cases, you probably still have bedbugs. I still think, with a shrinking but persistent part of my mind, that we could still have them too. We could always have dormant ones, and hey, we could always get them again. But for me, in my particular situation, I needed to know a very specific answer to some very specific questions. So now I have a little more information. I hope this helps others as much as it’s helped me. First, when we’re told a lot of people don’t get bitten by bed bugs, I wonder if this is an error. Parakeets was quoted a statistic by entomologists at the Bed Bugs conference she attended last fall, that as many as 70% of people are not bitten. I have no idea where they got the statistic from, and would love to know. Has anyone ever verified that in any way, or was it assumed that since some people did not react, they were not being bitten? G assumed he wasn’t, and many of us have roommates, family members or partners who thought the same of themselves. G’s research is valuable in that it is proof at least some people are bitten and show no signs. I hear a deep-pitched collective gasp; while some men suffer from bites (hello BuggedinBrooklyn, Willow-the-wisp, et al. ), and some women don’t, we at Bedbugger.com usually hear from women who are bitten that live with unaffected men. That might simply mean men don’t talk about their problems as much online, or that this site just appeals more to women. But it looks, from where we stand, that women are more likely to suffer from bed bug bites in a home with both women and men present. Secondly, S’s research backs up Sean the PCO’s experience — he has said that his nymph and adult bites look the same. S has proved that in her case, at least in this instance, that is true. Many people have assumed that their smaller bites were from nymphs. But this was just speculation. I’ve often cautioned against making assumptions about why this bite or that bite looks as it does, and in light of this experiment, I’m even more inclined to be cautious: when it comes to how bites look and how they feel and when and for how long they appear, you really don’t know for sure, unless you see it happen, like S and G did. But remember, S’s other bite photo (on the bite photos page) looks quite different: this is evidence that even on the same person, every bite does not cause the same reaction. Folks may want to look back at the comments following the lingering sensations post I wrote a month ago. You should remember that one of the three regular Bedbugger commenters who speculated they might be having “lingering sensations” or phantom bites now has evidence s/he is still being bitten. I think S has good reason to think she’s not getting bitten at home now, as she says. Her experiement gives her some good information on that. But the other Bedbugger’s experience is a caution against assuming your itchy “bites” or sensations are not from bed bugs, and against waiting too long to find out, rather than taking action. S has some follow up on the bites three days after the deed was done, so this is now a three-part series. More to come Friday at 9 am EST! Thanks again to S and G, the first official Bedbuggers of the Week! Update: and here’s bed bug bite fest part 3. S…I appreciate your experiment more than words can express. If I lived in the Chicago area I would also be wiling to do this. For me,, it was always the itch that led me to the bite. There was another male on our Blog who always itched but showed no bite signs. It is disturbing that G showed neither a bite nor an itch. I am hoping that maybe he is experiencing a delayed reaction…and in the very least an itch will surface. Can you tell us how your PCO reacts? WOW WOW WOW! Hymenoptera has some deep thoughts there. I suppose if people who slept together … and one was “being bitten” and one “was not being bitten” that they might propose to exchange places in the bed for like a week and see if that does anything to shed more light on this skin thing??? the so called, self-diagnosed “stress-boil” I had on my right thigh” around Christmas/New Years … could have been my first bite. I still have a nickel sized, white-like fatty encapsulated pustule there on my lovely loin–and I suspect it will be there for the rest of my life too. Very pertinent too, are NBOM statements: more women may be visiting the sight and more women may be talking about the bites. sounds more like a Creole dish rather than a chemical in the shed skins of the instar, but that too is not ruled out in this experiment yet. I suspect we will be talking about S. and G. for a long time to come, and not just for their heroic efforts but due to the fact that S’s lingering sensations and bumps have been so widely variable over a long period of time while G is seemingly not sensitive or has very easily become immuned. Please guys scratch/itch–cough it up and spill the beans on how your bites are affecting you. BIB suggested we have a proper skin chat which, I do think is highly in order: FYI when BBWarrior wrote me about her husbands terrible lumps and swelling–I had to toss my partly thought out hormonally based little skin chat theory down the tubes, which; I was really more than happy to do! We need to here more from the guys as well as the girls! Me? It’s like a creepy crawly feeling a great sensitivity comes and goes to things I wear. I have seen a few guys out in SF recently just taking their sneakers off in public, and inspecting them. I do seem to get those pins and needle like reactions too—and it doesn’t seem to matter what’s on my mind or where I am. I get them everywhere and while I have not ruled out that the bugs are in my shoes—I am doubting feet would be a favorite place for them to bite, as—the skin there is so thick—especially on the heels–Supposition yes. Just some info on lesions I wish to add that may help. The only experience that I can recall is that after some time had past I started to notice a couple of hard pimples on the back of my head. Now after six months of the discovery and three treatments and steaming and DE applications I have a rash on my arms followed by a rash on my chest. Note that I have also had my office treated and I applied some DE in strategic locations. No specimens have been found in ten weeks in both locations. I am speculating that I in fact had been bitten at the same time as my wife but had delayed reactions that I am now experiencing. I love the salt water and sunshine, the first chance I get I am hoping a beach day will help my skin rash. I do acknowledge the possibilities that the rash may appear again in the fall. This is great information and I thank S and G for the sacrifice to give it to us. It must have been very difficult to go through. My only comment is that when I was getting bit, the location of the bite seemed to affect how I reacted to it. Bites on very fleshy parts of my body (i.e. underarms, legs, etc.) turned into big, itchy welts. But, bites that seemed to be right over bone (eye brow, upper cheek) were small little bumps (actually, I got bit on my eye brow twice and there was no bump, it just got itchy and red) and they weren’t that itchy. I’m not saying that S’s small bumps are bed bug bites! I’m just saying that I think the location of the bite can affect the reaction. 1. Excellent experiment. We need more like this. I advocate to go even farther. I think research should be done in a sleep lab using night vision goggles or infrared tracking to pinpoint all the BB’s behaviors: when do they come out? where do they prefer to hide? Would using a CPAP mask and venting it elsewhere prevent CO2 detection, and confuse them? etc. 2. Chitin. Chitin is found in a myriad of things you wouldn’t dream of. Are you eating shrimp, crab or lobster? Well, those shells aren’t made out of plastic. Chitin is now used in a variety of products you may not even know of. It is used in vitamin capsule casings, surgical sutures. The following I pasted from a chitin website. Make-up powder nail polish; moisturizers; face, hand, and body creams; and toothpaste, Dietary Supplements: Chitosan has properties similar to plant fiber and can significantly bind fat, acting like a sponge in the digestive tract. It is not digestible itself and the bound fat leaves via the body without ever entering the bloodstream. So any of these things may provoke an allergic reaction without any bedbugs in site. Speaking of which: Bugz, good ideas. I think the “test bug on skin” (unlike the voluntary bites) is something most people should try should they have the chance. If there is a reaction, reactions to other substances should be tested. An allergist could probably test chitin reactions, though there may be a difference (from what I’ve read) between being allergic to shellfish and being allergic to chitin from an insect. Part 3 was already written yesterday, but due to the magic of computers, will appear on the internets at 9am EST Friday, as its predecessors have done. WMSB, NO, I was not referring to you as someone who was being bitten. I was referring to someone else from that conversation (name deleted here). I would not speculate on the source of someone’s itching, I say this because we were told it was so, and not long after the discussions on lingering sensations. IT IS 3:00 AM AND IM RESEARCHING BED BUGS AND I HAVE TO SAY TO S&G THANK YOU THANK YOU THANK YOU !!! I’VE SEARCHED LONG AND HARD TO FIND ACTUAL PICS OF BITES, EVEN THE HARVARD UNIVERSITY INFO DIDNT HAVE BITE PICS, I THOUGHT I WAS HAVING A STRESS RELATED SKIN CONDITION AND WAS READY TO GIVE UP AND JUST DEAL WITH IT BUT WHEN I WENT TO THE INFO SITE WHERE YOU WERE LOW AND BEHOLD YOU HAD MY BB BITES. I’M SINCERLY SORRY FOR WHAT YOU WENT THROUGH BUT I’M NOT SORRY FOR THE RESULTS AGAIN THANK YOU EVER SO MUCH FOR YOUR TROUBLE. I’M INDEBTED TO YOU NOW THAT I KNOW WHAT HAS HAPPENED TO ME. MAY ALL BB DIE! I KNOW MINE WILL!!!!! Shortly after my first “Spray and Pray” treatment of my bedroom, I went to the dermatologist at the PCO’s suggestion to confirm that I indeed had bb bites. The Dr. confirmed that I had a hair follicle infection/inflammation consistent with an insect bite. The inflamed hair follicles present much confusion about the bb bites. My conclusion is that at different stages the bites are of varying severity. I still believe this to be true, because, although I continue to get bitten, I get the white pustules only intermittently. but any ideas how to get rid of them WITHOUT an exterminator? If there were easy, foolproof ways of getting rid of bed bugs, I would plaster them all over the site. The best advice really is to get a pro with experiencing eliminating bed bugs. Have them come back at two week intervals until there are no bites or bed bug sightings. This generally takes 3 or more visits. If you wish to read about how the cleanup is to be done, and what to do. It is full of heaps of helpful and permanent killing information. Hello, I recently moved to South Korea to start teaching English. Before I got here my room was thoroughly cleaned and I have a new mattress, sheets, the whole nine yards. I started getting these isolated bumps that itched. At first I thought they were ring worm but after applying anti-fungal like crazy they have still not gone away. Now, some of them are fading but others are still very sensitive and when I push on them blood pulls under my skins surface. I have also found a rash like trail on my stomach now. I washed all my linens and searched for signs of bed bugs and didn’t see any. Any thoughts? If bed bugs are disturbed while eating, then the bites will be distributed and therefore each will be smaller and probably less itchy. I don’t think the fact that these single, 10 minute-long bites were itchier and bigger means that the other bites weren’t from bed bugs. If bed bugs are disturbed while eating, then the bites will be distributed and therefore each will be smaller and probably less itchy. We’ve heard bed bugs may be disturbed and “start over,” and this may be one explanation for the “breakfast, lunch, and dinner” pattern people bitten by bed bugs may experience. I don’t think it’s necessarily true the subsequent bites will be smaller or less itchy. 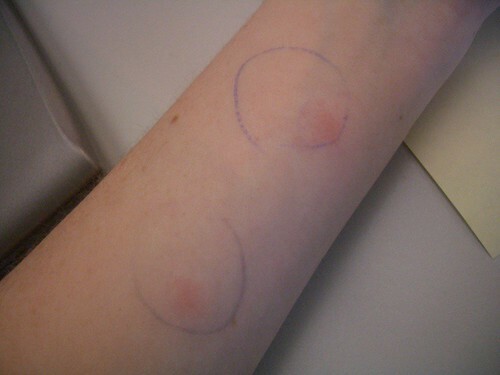 I’ve recently also heard one secondhand report of someone being bitten in one place under testing conditions and claiming two bite marks arose as a result. We just do not know a lot about bed bug bite reactions. I hope more research is done on this soon. Can anyone give some anecdotal info about how long it takes for bb bites to heal? I’ve read a lot about how itchy they can be, seen pictures, but nothing really about how long these are taking to resolve.